In offset printing machines, overlaid paper bags are fed automatically to the machine one by one. 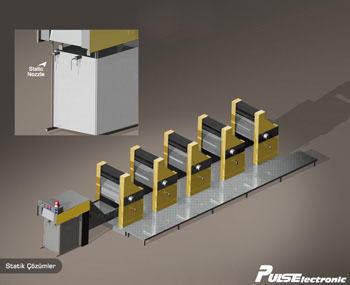 Particularly on fine paper and during the loading of PVC products on the machine, it is observed that the machine takes a short time to stop the machine, causing the printing surfaces to collect dust and reduce the print quality and the operator is constantly exposed to electrical shocks. It creates an undesirable situation because it will lead to increased scrap and work and loss of labour.To solve this problem, antistatic nozzles are installed as shown. By applying ionized air between the nozzle balls, the nozzles will prevent electrostatic sticking and as well will prevent further problems by allowing the paper to be transferred one by one, and in the meantime will allow the existing dust particles to be thrown off the surface.